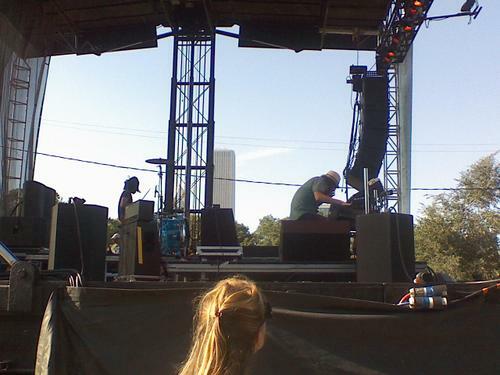 jacks mannequin's set was the same old jacks. their set was solid with andrew mcmahon still putting on his game face for the crowd. they had a good turn out with the crowd and everyone seemed pleased to be there. the only difference between this set and the summerfest set i reviewed was the new song that they performed at lolla. this song had the same feeling of a jacks song, but lyrically from what i heard, reminded me of a something corporate song. after their set i went off looking for my friends. after jacks, i met up with my friends and sat under the trees in beautiful grant park. ive only been at lolla for 2-3 hrs and the heat was already hitting me. after sitting around and talking for a little, and have a glass of wine, we headed over to silversun pickups. now this is one of my friends favorite bands and ive heard so much about them, that i had to check them out. from what i saw, they were a very tight sounding group. the crowd seemed to be very into the band and the singer seemed to have love the crowd's reaction. i left half way through silversun pickup's set to see one of my favorite bands of 2007, blonde redhead. thier recent cd, 23, is one of my favs this year with songs like "23", "dr. strageluv", and "sw". they started off their set with my favorite song on the cd, "dr. strangeluv" and just progressed to grab my attention. they sounded so good live, and i just sat down on the hill behind the stage and just proceeded to listen to them and take it all in. even though there was not a lot of small talk in between the band's songs the crowd still seemed to eat them up. after blond redhead, i headed on back to the media booth area. over there there was a ton of media people from all your favorite places, such as spin, mtv, q101. i felt so out of place. i mean, me, a person so young and doing this for the first time, surrounded by the big dogs, doing this for a living, it was kind of intimidating. while hanging out in the media area, i realized i missed out on free pizza and missed all the water. so i was sitting back there and i ran into the ice cream man. this guy is something. his goal is to go around the us and soon the world and give away 500,000 free ice cream. let me just say he made my lolla a little more enjoyable the next couple of days, as i helped him reach that goal haha. after a little snack, i went to the myspace stage and watched the band lcd soundsystem. now i have never heard of this band before and so i didn't know what i was in for. let me just say that this band was probably my top 3 best bands of lolla. this band put on one hell of a show. i knew i was in for something when the drummer is set up on stage left haha. just the lead singer's energy and voice during this set was unbelivable. and the whole band sounded tight and on the same page. their set went from a concert to a party with beach balls being tossed around and people dancing all around me. right after lcd soundsystem, daft punk came out and started playing a little intro music. i was standing far back so from the looks of it i couldn't make out what was on the stage, but as i moved closer and closer i saw a lcd pyramid in the middle of the stage with lights set up all around them. now i heard that daft punk does one hell of a light show during their sets, but that was an understatment. this band was probably my favorite headlining band of lolla. i mean even thought it wasn't a full band playing a set, it was two guys doing their thing, and getting people off. 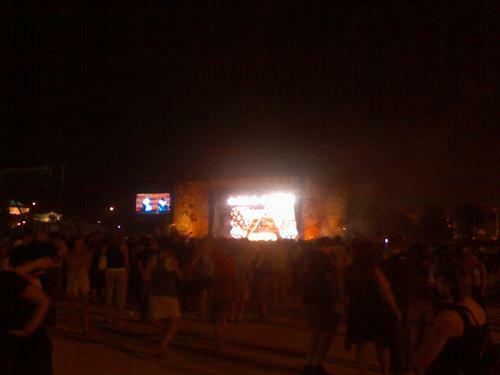 the festival grounds turned into a huge night club and people were dancing throughout the whole set. the high point of their set, i thought, was when they played "technologic" and had all the words just popping up in the back on a hugh screen that they set up on stage. another cool part of their set was when they returned for an encore. they came out and had track lighting on their robotic suits and as they were leaving the stage at the end of their set, they are just standing with their back towards the crowd with "daft punk" written out on their backs with lighting. after a tiring day at lolla, i ended up hitching a ride from a total stranger (word of advice: don't ever do that) and ended up finally eating my first meal of the day at a resturant, on the gold coast, called tempo. after tempo, i was tired and ready to sleep, so i ended up staying a my friend's sisters place, so that i didn't have to drive all the way back to the suburbs. my first day at lolla opened my eyes to a more serious festival, compared to warped tour, and i tried my best to absorb it all in. i will update you guys with my day 2 and day 3 events as soon as possible. stay tuned.